These successful puppy training tips will help you to teach your new pup some polite manners, especially useful if he won't listen to a word you say! 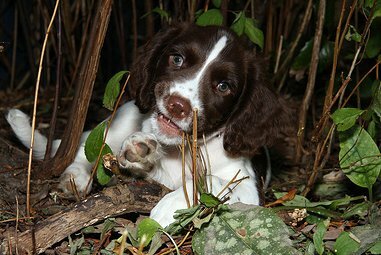 Begin training your puppy right now and follow these top tips to help you get the best out of your Cocker Spaniel pup. I'm new to this but I'm keen to learn! "Help, my new puppy is simply adorable, but he just won't listen to a word I say!" "He just wants to do what he wants to do and takes no notice of anything I say to him!" Having a Spaniel puppy around may be very exciting, but if you don't know how to train your puppy it can make you stressed and anxious and can cause misery for you both. If you've never owned a puppy before, or this little fella is particularly 'headstrong', these puppy training tips will help you to approach your little guy's training in the right way (and in the right frame of mind) to help you both stay on track. 1: Early Learning Is Best! One of the best puppy training tips I can offer you is to begin teaching your puppy obedience training as early as possible. 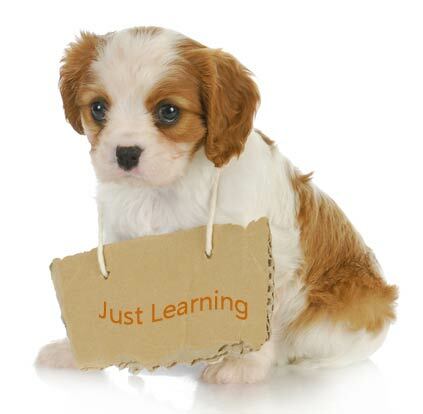 Puppies are much more receptive to learning when they're between 8 and 12 weeks old. They're like little sponges at this age and can take in so much during this time. Leave it much longer and you're really going to struggle. Start off on the right foot and begin his puppy obedience training now! 2: Puppy Training Tips: No Distractions! Training puppies when there's lots going on in the home simply won't work. For example, training your puppy when the kids are around or when there's a lot of people coming and going is a recipe for failure. Your little boy will be easily distracted and won't learn. He won't be listening to a word you say because he'll be too busy watching what's going on around him. Find a quiet corner away from everyone else or better still another room where you and your puppy can concentrate on the task in hand. Help him to get it right! Consistency is the key to your puppy's training. Your Cocker puppy (like all Cocker puppies) will be so eager to please, but because he's so young and inexperienced, he won't always understand what you want from him. It's your job to make life easier for him and help him to understand. Your instructions and commands must be very clear and consistent. 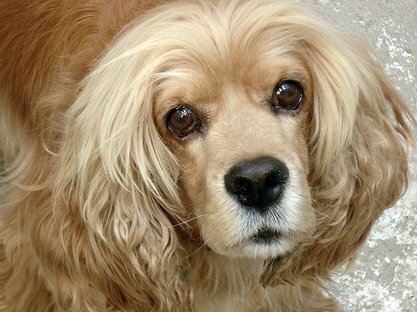 If your family gets involved in your Cocker Spaniel's training (and they should) you will need to make sure they all use the same word for each of your puppy's training commands otherwise he'll become confused and won't learn. Don't set him up to fail. Choose a short, simple word for each command, preferably with only one syllable, for example: sit, stay, come, down and stick to it. If you're wondering what a release word is, it's exactly that; a word that will release your puppy from a previous command. When you use your puppy's release word, you're letting him know that he no longer needs to 'Sit' or 'Stay Down', and that he's free to get up and play, or move around. For my Cocker Spaniel, Max, I use the word 'Okay', but feel free to choose whatever word you feel comfortable with, so long as it doesn't sound like one of his other command words. Once you've chosen something you're happy with, as with all command words, it's important to stick to it so that your puppy is getting the same message each time you use it. Using a release word for your Cocker Spaniel not only helps to reinforce his training, it also helps strengthen and reinforce your leadership status each time you release your dog. When you're giving a command to your little guy your tone of voice is very important. Whilst puppy training sessions should be fun for your pet, the tone of your voice should be firm and low (but not threatening or frightening) and confident when giving a command. When asking your dog to 'Stay' (for example) don't drag the word out or raise the tone of your voice at the end (like this...staaaaaay?) because it will almost certainly sound like a question and your puppy may not pay too much attention to it. Be confident. Give the command word in a no-nonsense, matter-of-fact way. It's an instruction, not a request. And don't forget to change the tone of your voice to a lighter, more fun sound, when giving him lavish praise when he gets it right. Okay, so what's positive reinforcement when it's at home? It's the rewarding of a desired behavior with something pleasant in order to encourage that behavior to be learned and repeated in the future. For example, each time your puppy does what you ask of him, or displays a behavior that you're happy with, you reward him with lots of praise and/or a small tasty treat to show him that he's done exactly what you wanted. Your praise and reward should be given within 2 seconds of his action for it to be effective. For example, if you ask him to sit and he obeys, give him a treat and praise him immediately, and certainly within 2 seconds. If you leave it any longer you run the risk of your puppy not linking his behavior to his reward and it will take longer for the 'penny to drop'! There are puppy training tips and there are puppy training tips...and this one is probably the most valuable because if you use it well it will pay you back a thousand-fold. Just remember, positive reinforcement never involves harsh punishment, just lots of praise and a treat or two when your puppy gets it right. What if my puppy doesn't understand or gets it wrong? Dog training is never easy and it may take several attempts before your puppy understands exactly what you want from him; there will be times when he's just not getting it (I'm sure we've all been there). My advice is to pack it in for a while and do something fun, like playing with a ball or blowing him some soap bubbles and then try again later. If your puppy understands what you want but he's just 'playing up', (and you'll know if he is) don't let him get away with it just because he's cute. Don't reward him for getting it wrong, or for misbehaving because that will only encourage his 'naughty or unwanted' behavior and he'll do it all the more! If he gets it wrong, you can say something like, 'Too Bad', or 'No', to help him understand that he didn't get it right, but your tone shouldn't be scolding. Training a dog who is misbehaving or has never been trained will probably take a little longer because he will have had plenty of time to develop bad habits. Bad habits can take a long time to break, however, despite what they say, you CAN teach an old dog new tricks! It can be very frustrating when your puppy is continually getting it wrong, but the last thing you want to do right now is to become angry, scold or even smack (!?) your puppy for not understanding what you want from him. If your Cocker doesn't do what you've asked, and your requests have been clear, it probably means that he's not yet mastered that particular command and needs a little more time to make the connection. Take a little time out before trying again. Continue with the exercise and don't move on to another command until you're confident that he's mastered the current one. And don't be too hard on him. He's only young and he's still learning. When I'm in the park with my dog, I often hear owners asking their dog to sit (usually before they put their dogs back on the leash) but they don't just ask once, they ask several times and then eventually the dog might sit or the owner gives up and puts the lead on anyway. It's important to say the command word only once. Because if you have to repeat the command over and over again your dog will soon learn that he doesn't have to act on your first instruction. He'll think it's okay to obey you on your third or fourth command (or more - yikes!). Solution: Get His Attention First! If your pup is guilty of this, get his attention first, before you issue the command word. You can easily do this by either saying his name first or by using the 'Watch Me!' command before asking him to sit, stand, stay or whatever it is you're asking him to do. 9: Puppy Training Tips: KISS! Keep it short and simple because puppies have a short attention span! In order to keep your Cocker puppy interested, keep his training sessions to around 10 minutes or so each time. This should be enough to allow you to run through some simple commands without your little fur-ball becoming bored. Try several short sessions each day and always try to end your dog's training exercise on a positive note to keep him encouraged. 10: Practice, Practice, And More Practice! Practice, practice, practice; it really does makes perfect! As your puppy masters each command, practice daily to strengthen and reinforce his response to it. Practicing obedience commands will help to establish you as the pack leader and will also strengthen the bond between you, and that's no bad thing, eh? The sooner you begin your puppy's training, the sooner you'll see your little bundle of nervous and sometimes boisterous energy emerge into a well-behaved, well-mannered, adorable little Cocker Spaniel!